What Do Pagans Wear? - Is There a Pagan Dress Code? 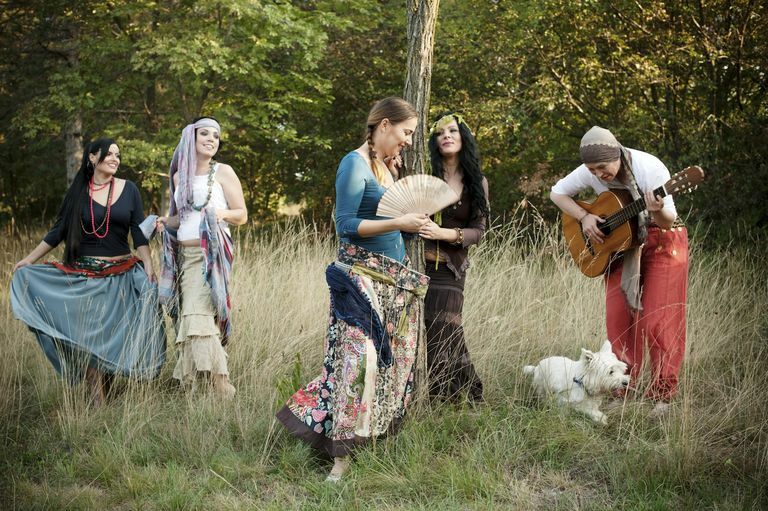 Question: Reader Mail: Do Pagans and Wiccans Have to Dress a Certain Way? Do all Pagans have to dress a certain way? I recently have started studying Wicca, and all the other Pagans and Wiccans I've met seem to dress funny, and wear long flowy skirts, peasant tops, and gobs of giant jewelry. I feel out of place at public events, because everyone is wearing things that look like Ren Faire garb, and I'm really more comfortable in a polo shirt and a pair of Dockers. I don't even like jewelry. Do I have to start dressing differently now? Well, you can if you want to. There’s no Wiccan Membership Book, however, telling you that it’s time to drop your khakis and polo shirts and exchange them for flowing robes and lots of black eyeliner. However, just like in any other religion, Wiccans and Pagans are people. Do keep in mind that one person's "dressing funny" can be another's "dressing for comfort." Some people like jeans and t-shirts, others like pink tutus, and some like to dress like they’re always at the Renaissance Faire. It’s entirely up to you what you wear. Be who you are, and be happy about it. Some people may dress in a manner you consider "normal" during business and home situations, but for ritual events, they like to dress in a way that makes them feel special. You don’t have to wear a pentacle the size of a dinner plate just because you’ve decided Wicca - or some other form of Paganism - is the right path for you. If you don't dig jewelry, don't wear it. You're not required to wear it simply because you're now Pagan. For many people jewelry is not only a method of personal expression, it's also a way of signaling to other people in the community that you have something in common. It's kind of a beacon that lets others know that you share sometime. One thing you'll notice as you spend more time with other Pagans is that for the most part, people try not to be too judgmental. You'll meet Pagans in clothing that seems unusual, you'll meet disabled Pagans, you'll meet gay and lesbian and polyamorous Pagans, you'll meet overweight Pagans, and you'll meet Pagans who are all or none of the above. The really important thing to remember, though, is that your spirituality is not defined by what you look like on the outside. Coloring your hair black and wearing fairy wings doesn't make you Pagan, any more than wearing sensible shoes would make one a Christian. Your belief system and practice is something that comes from the inside. Don't worry about feeling out of place if you're wearing your business casual attire at a Pagan event - chances are there's at least five other people looking at you with envy, wishing they had dared to show up in something from the LL Bean catalog. I'm Pagan and Going to Court - Do I Have to Swear on a Bible?